Unitized Structures Group at Virginia Polytechnic Institute and State University, led by Dr. Rakesh K. Kapania (Mitchell Professor of Aerospace and Ocean Engineering), and Dr. Sameer B. Mulani, Dr. Wesley C. H. Slemp, and Davide Locatelli have been involved in development of frameworks for optimization of stiffened panels using curvilinear stiffeners and supersonic wings using curvilinear spars and ribs. Experts predict the use of unitized structure is expected to grow exponentially by the year 2020. Research has shown that unitized structural result in a) reduced part count, manufacturing cycle time, and fabrication cost; b) added design flexibility, weight savings, inspectability, and resistance to fatigue and corrosion; c) enhanced automation, improved ergonomics and reduced work fatigue and corrosion; d) increased determinant assembly (DA) opportunities, improve fit and reduce design rework. Innovative manufacturing techniques like Electron Beam Free Form Fabrication (EBF3), Friction Stir Welding (FSW), and Selective Laser Sintering (SLS) are additive in nature as opposed to subtractive, meaning that the material is deposited wherever necessary on the contrary to removal of unnecessary material from the structures. These techniques have created new opportunities and a much bigger design space to optimize structures of complex shapes especially the aerospace vehicles without much material and energy wastage (Green Technologies). New types of pressurized non-circular fuselage structures within hybrid wing/body vehicles that undergo complex structural load cases are not well characterized using current design databases. A new framework EBF3PanelOpt is being developed for design and optimization of complex multifunctional aircraft structural concepts like stiffened shells and panels. Commercial software, MSC Patran (geometry modeling and mesh generation), MD Nastran (Finite Element Analysis), VisualDoc (external optimizer) and Python are integrated in EBF3PanelOpt frameworks to design stiffened panels. The parametric geometry modeling features of MSC Patran are critical for the successful operation of the optimization framework. Currently EBF3PanelOpt framework allows the user to optimize multi-sided panels with straight/curved edges having curvilinear, blade-type stiffeners under the action of uniform or non-uniform in-plane loads. The framework supports multiple load-cases analysis as well as different thicknesses for pockets of plate formed by intersection of the stiffeners or uniform panel thickness. The mass of the panel is minimized subjected to constraints on buckling, von Mises stress, and crippling or local failure of the stiffener using global optimization techniques like Particle Swarm Optimization (PSO) or gradient based optimization techniques. The orientation and curvature of stiffeners play important role in the optimization apart from the thicknesses and heights of the stiffeners. 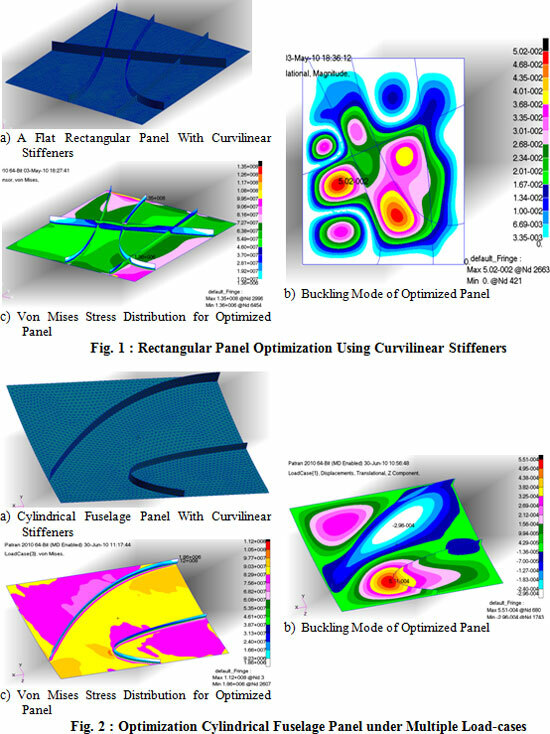 Figure 1-a shows the flat rectangular optimized panel designed using EBF3PanelOpt During the optimization of this panel, non-uniform thicknesses for panel pockets were used. From Fig. 1-b, it can be seen that all panel pockets are in the process of buckling, and Fig. 1-c shows the von Mises stress distribution for the applied load. Figure 2 shows an optimized cylindrical fuselage panel under multiple load-cases, von Mises stress distribution and buckling mode shape. 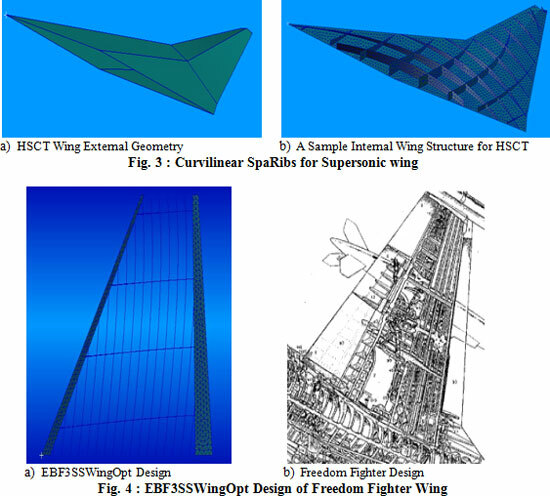 A tool called EBF3SSWingOpt is also in development to utilize curvilinear spars and ribs to optimize supersonic wings. In this framework, MSC Patran, MD Nastran, VisualDoc and MATLAB are integrated to optimize supersonic wings. EBF3SSWingOpt has the capability to optimize the wing using curvilinear spars and ribs (SpaRibs) for static aerodynamic loads against bucking and von Mises stress. Curvilinear SpaRibs redistribute the loads and changes its buckling modes as well as vibration modes so that one can control aeroelastic behavior and static behavior. Currently, EBF3SSWingOpt uses 'Translation' utility of Patran to generate SpaRibs, it adds the optimal number of SpaRibs in the wing based upon the bounds of translation parameters given by the user. Figure 3 shows the example of curvilinear SpaRibs inside High-Speed Civil Transport (HSCT) aircraft. This framework has the flexibility to put SpaRibs in the selected area by the user. Using this framework, Freedom Fighter's wing is optimized; the comparison of the optimized wing with its original design is shown in Fig. 4. The work of EBF3PanelOpt is funded under NASA Subsonic Fixed Wing Hybrid Body Technologies NRA Contract (NASA NNL08AA02C) with Ms. Karen M. Brown Taminger as the API and COTR and Richard Keith Bird as the Contract Monitor. The authors would like to thank our partners in the NRA project, Mr. David Havens, Mr. Robert J. Olliffe, and Dr. Steve Engelstad, all from Lockheed Martin Aeronautics Company of Marietta, GA, for their contribution in the present research. Unitized Structures Group at VT would like to thank Ms. Marcia S. Domack (Technical Monitor) of NASA Langley Research Center for substantial technical discussions. EBF3SSWingOpt was conducted as a subcontract from the National Institute of Aerospace, Hampton, Virginia. We would also like to thank Mr. John E. Barnes, Mr. Ryan J. Wittman and Mr. Agustin Garcia, all from Lockheed Martin Aeronautics Company for their technical inputs. Dr. Sameer B. Mulani, Dr. Wesely C. H. Slemp, Davide Locatelli, and Prof. Rakesh K. Kapania.